iNETsolutions.de Review 2019: Is iNETsolutions.de a Good Hosting? Rather than offering fixed-price hosting plans with fixed features and resources, this company allows you to customize your perfect hosting plan using an online configurator. When it was founded in 2005, German hosting company iNETsolutions.de only offered an email service. Today, its products include all types of web hosting, dedicated servers, and domain registration. This vendor’s well-organized website is available only in German. All hosting packages come with the drag-and-drop “Homepage Building Kit” website builder which allows you to build your professional-looking website from scratch without web design or development knowledge. The hosting packages are also “application ready,” which means you can almost instantly install web applications such as WordPress, Joomla, and the Typo3 open-source CMS. There is also an uptime compensation plan that pays out various percentages if the actual uptime falls below the promised levels. Although there is a knowledge base / FAQ section with a few tutorials, it doesn’t do much to answer my questions. So it seems the only way I can hope to have my questions appropriately answered is to call the German support telephone number. With this vendor, it should be possible to compose your perfect hosting plan using the online configurator. The main downside for me is that I would have expected a better bedside manner from the support staff. Create a customized web hosting package with iNETsolutions.de. 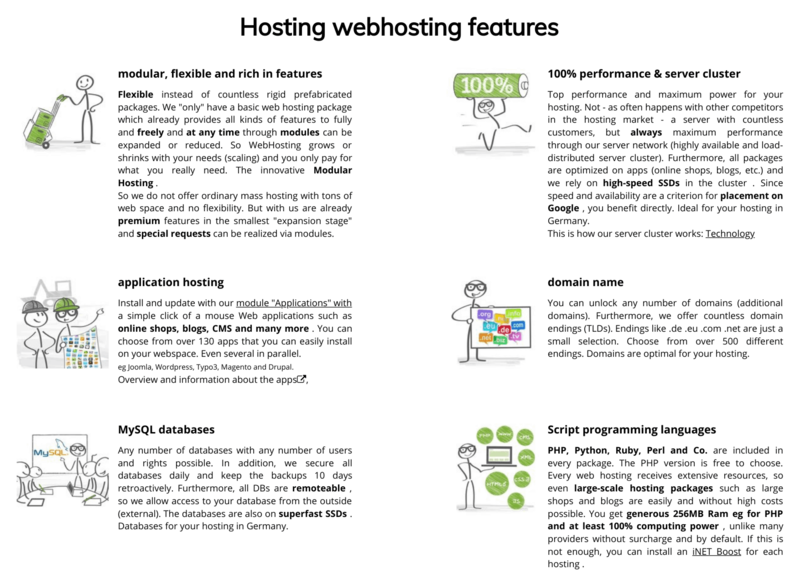 Wondering how iNETsolutions.de stacks up against other Web Hosting companies? Enter any other Web Hosting company and we will give you a side-by-side comparison.